The website ProFootballFocus.com, whose staff is in the business of analyzing every single snap of every single play of every NFL season, has a post up today that will likely raise some eyebrows around B’More. They named one of the Ravens’ outside linebackers as tops in the NFL at his position since 2008. I know who most of us automatically think of, but based on the title of this post you can tell it’s not Terrell Suggs. 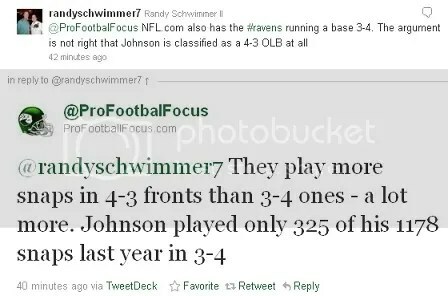 Even though he’s top of this list, you wonder sometimes if Johnson is a little miscast in how the Ravens use him. A truly elite linebacker who is unmatched in run defense, Johnson has never (nor can you imagine him becoming) [been] a player who puts the quarterback under consistent pressure. But, he’s a huge part of one of the greatest run defenses in the league, and has finished with our highest grade among 4-3 OLBs in run defense for two of the past three years. While we love JJ around here, most in Baltimore would have never really considered him “elite.” He strikes us as a blue-collar type who is happy to do whatever it takes to help the team, and who gladly lets his more bombastic teammates take all the credit. However, these experts beg to differ on that point, arguing that #95 is just as important to the defense as #52 or #55. You may have also noticed the assertion of PFF that the Ravens play a 4-3 defense. This runs contrary to popular belief as well. Pretty much every time the Ravens are on television, the defense is presented as a 3-4 configuration, and common knowledge around NFL fan circles still dictates that the Ravens are a 3-4 team. That, more than their stance that Johnson is elite, sparked up quite the intense and interesting debate on Twitter following the posting of the article. If you’re so inclined, it’s worth the time to click over to PFF’s twitter feed and read the entire argument. 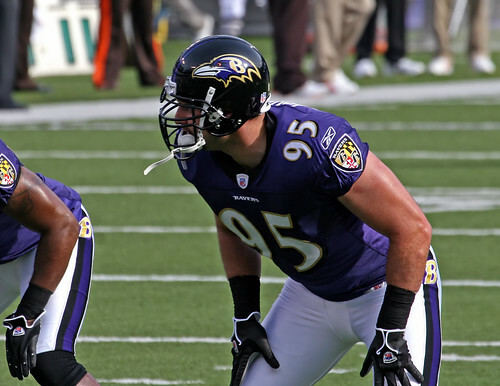 As for us, we have a newfound respect for Jarret Johnson, and will be watching the Ravens’ defense this year with an even more discerning eye, hoping to use some newly gleaned knowledge of what separates the 3-4 from the “4-3 under” in the Ravens’ scheme to better understand what we’re seeing. Football is getting close people. Keep the faith. This entry was posted on July 20, 2011 at 11:18 am and is filed under Ravens. You can follow any responses to this entry through the RSS 2.0 feed. You can skip to the end and leave a response. Pinging is currently not allowed.